Themes are popular and recurring plot elements found in fiction. Many readers have strong preferences about what themes they like or don’t like. For example, I’m a romance reader, and I’m *here* for a good sudden baby story but have no patience for secret baby stories. Preferences like mine are great for readers’ advisory because tapping into themes helps you narrow down your readers’ fantasy preferences down to the hidden heritage books they really love. Add in appeal and genre, and you’ve got all NoveList’s story elements working together to help you find a book your reader feels was especially written for them. If I’ve convinced you about the magic of themes, we have lots of ways for you to get started talking about themes with your patrons. It’s hard to talk about themes for genres you’re not familiar with, so we’ve got all our themes and their definitions posted to our help pages. These pages will help you sort the eerie mysteries from the real life monsters, and chosen family stories from family gathering ones. Adult and children’s librarians alike will find looking for picture books easier with the themes for younger kids. Themes make finding picture books on being a friend, coping with death, and Welcome baby! a snap. If you’re looking for information on all of NoveList’s story elements, we’ve got definitions of our appeal and genre terms here as well. Themes are perfect for book displays. Pick one or two of your favorite themes and put up a display. Or, pick a genre and put up a display of books with a variety of themes, making sure to let your patrons know about the different types of books with bookmarks, shelf-talkers, or other signage. 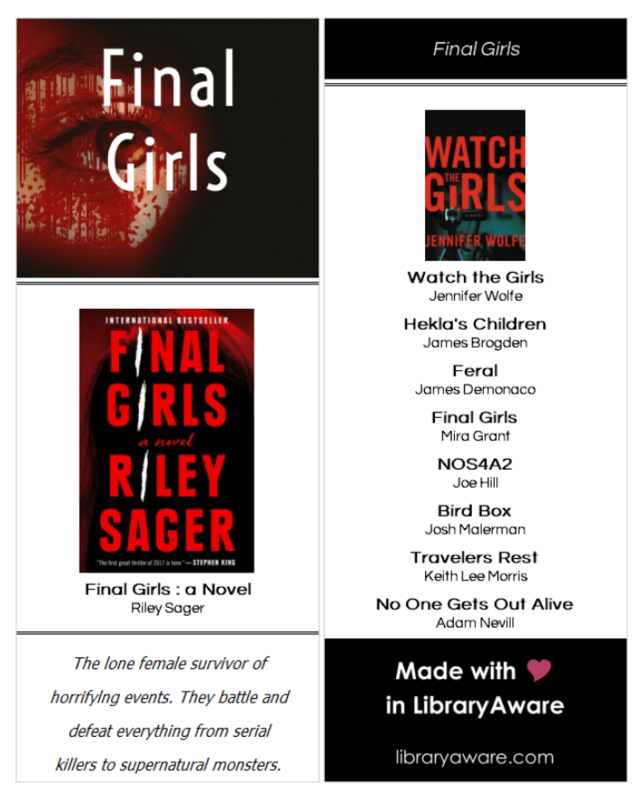 If you want to make your displays even easier, use one of the theme-based book flyers or display flyers from LibraryAware. We’ve got ready-made bookmarks, too. If you really want to make displays easy for you and your fellow librarians, steal this idea from the Durham County Library and create your own Display Hub. There are many different ways to do form-based readers’ advisory, from forms on a website to cards a patron can fill out. Include themes in the options you give your patrons and encourage your readers to mix and match all the NoveList story elements. Keep an eye on our Pinterest board of NoveList Promotional Templates. 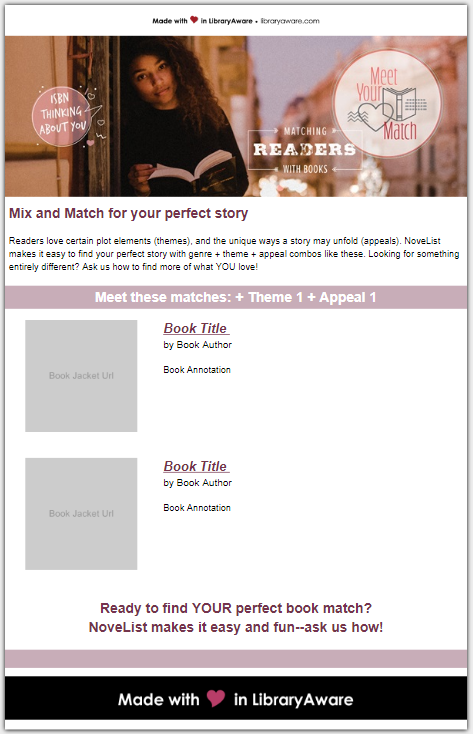 We’re adding more templates to LibraryAware to help you let your patrons know about the readers’ advisory services your library offers (including NoveList). In fact, why not send them an email? We all have readers who are DIYers. These are the readers who don’t want you to hand them a book; they want you to show them how to find a book on their own. And they want to be able to search for books in their slippers. At midnight. Of course, you know your patrons can use NoveList from the comfort of their own homes. If NoveList isn’t yet easy to find on your website, we’ve got some tips for you. But with you and your patrons in mind, we’ve done one better. The newest version of NoveList Select allows your patrons to mix and match their favorite story elements right in your catalog. Show your patrons how to use the story mixer, and they’ll come back to your catalog again and again in their quest for their next favorite book. Haven’t upgraded your NoveList Select yet? Upgrading is easy. No matter what tips and tricks you want to learn about in NoveList and LibraryAware, we’ve got training for you, from printable search strategies you can keep at the desk, to live training, to quick-hits YouTube tutorials. If you want your training to come to your inbox, we’ve got a quarterly training newsletter you can sign up for. To celebrate the launch of themes, we’ve got a special webinar for you. NoveList metadata strategy manager Cathleen Keyser and readers’ advisor extraordinaire Becky Spratford discuss themes, including how we came up with our lists and how to talk about them with your patrons. Ready to learn? Watch the webinar today. 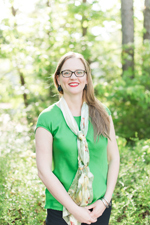 Jennifer Lohmann is the Director of Sales & Marketing.